With the arrival of December, in my professional life (as opposed to my running life) the “Next year” outlooks begin to pour into my email box from people looking to share their opinion. These opinions cover tips such as corporate balance sheets, new technologies, the outlook for earnings snd how the Federal Reserve will behave with the upcoming economic year and cycle ahead of us. These outlooks at times all look alike and one gets the feeling that some of these opinion people are copying other opinion people’s work! Often there is little in terms of what went right/wrong in these outlooks (because more often than not they were wrong). That is not the case ever on this blog from this “opinion” person! So starting today and working through all of December, I present to you my yearend wrap on my running and am outlook. I learned much this year about running form, running technique, running products and everything in between. So keeping a positive vibe going on the blog of late, Today I present you with, in the latest 5 for Friday; the 5 things that went well for me in 2016! NUMBER ONE: I ran more in 2016 vs 2015! As I mentioned in the November report, my running in 2016 was better than 2015 across many statistical measures. Most glaring is the amount of miles currently residing at 1025 (vs 935 in 2015). 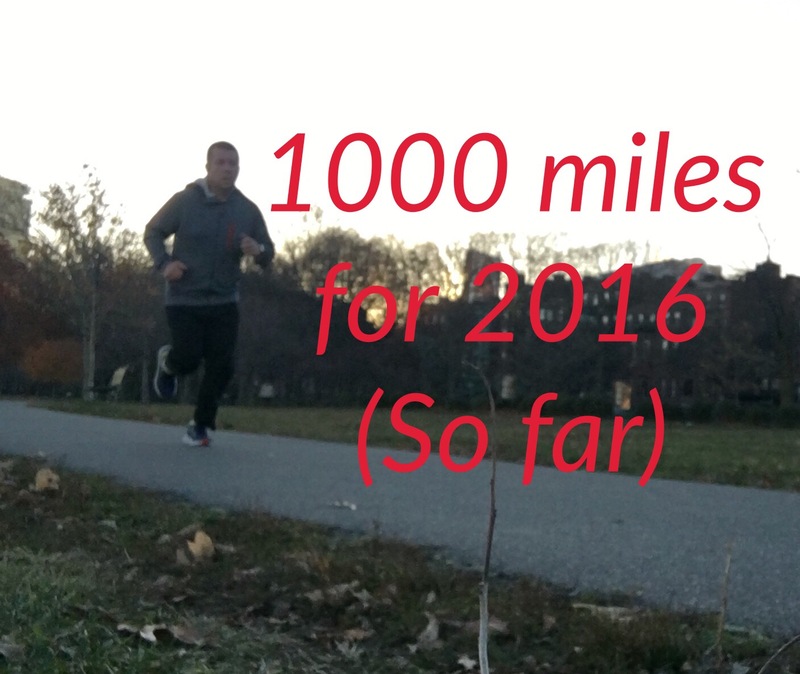 With a strong finish in December, I hope be looking at 1100 miles (and maybe 1150 if all goes well). NUMBER TWO: I started to listen to my body! This statement is not something that is new…it is the mantra of any experienced runner. Up till about 7 months ago, I openly spoke out against such because I don’t tend to stop at obstacles. I tend to run through them to conquer them if anything! But after trying to fight through injuries this year and then finding that rest does indeed heal all wounds, I have come to realize that listening to my body is ultra important! And after doing so over the past few months, I believe that such will not be a problem anymore. NUMBER THREE: Figuring out Pace Finally! I used to struggle with the 7 mile run before work because I would push so hard during the shorter training runs only to get tired when doing the same pace level at higher miles. I took a step back and slowed the pace so that I could run stronger when hitting miles 6-10. Result…now I am running strong in this area and now working on thr 11-14 mile area next. NUMBER FOUR: Mixing Surfaces well. This one is sort of a late in the year type of success (better late than never) but I will take it. Switching up the surface I have been running on has been such a great relief to my legs over the past few months. I have been running on trails and pavement and the end result is less pain at the end of each run and the hours that follow. In Boston, I run along the paths of the Charles vs rinsing on the cement and I hebe also venture to neighboring trails of late as well. By doing so, recovery time is down and I can get back out running! NUMBER FIVE: Better Nutrition the key! I started using Generation UCan bars this fall and when combined with some good healthy food (vs that of the “fried” variety), the next days runs have been solid. Also the reintroduction of Fish oils and Vitamin D has helped keep me healthy from all of these bad colds going around. By avoiding such, I can train without difficulty and this makes the running experience a better one overall! Lastly, I brought back the Chia seeds with Endura and that is working out well. Overall, with this better nutrition combined with better eating and heading into 2017, I am feeling good! Previous Post November Running Report: Progress Being Made!